(Bloomberg) -- Today in Brexit: All signs are that the Brexit negotiations are going down to the wire. Prime Minister Theresa May insists she needs to renegotiate the Brexit deal. From Brussels to Berlin, Paris to Dublin, leaders and diplomats say that’s impossible. May held a phone call with European Union President Donald Tusk last night that the EU side euphemistically described as “open and frank.” Irish Foreign Minister Simon Coveney said the U.K. was threatening to “jump out the window.” It’s not going terribly well. So what now? Behind the scenes, the EU determination not to soften its position is as strong as ever. There are no plans to haul leaders back to Brussels for another Brexit summit that diplomats fear would solve nothing. Some now suggest that the U.K. must arrive close to the “point of no return” before it will accept a deal. They hint at last-minute brinkmanship as late as the regular leaders’ summit scheduled for just a week before the U.K. is due to leave on March 29. The choice for May, in the EU view, would then be stark: crash out in a few days without an agreement, accept what the EU has put on the table, or delay Brexit — with strings attached. That’s not to say the Europeans aren’t gaming other scenarios. They can make additions or tweaks to the Brexit divorce treaty that would, they say, make it more palatable to the British Parliament. But palatable enough? They aren’t convinced, and that’s why they’re waiting to act. May won’t come to Brussels this week and officials say not to expect much movement from the European side before she returns to the House of Commons for a another vote on her deal on Feb. 14. Theresa May could rely on opposition Labour votes to win Parliament’s support for her Brexit deal, Thomas Penny reports. ITV’s Robert Peston says leader Jeremy Corbyn is moving toward backing her. Twentytwo, a $1.3 billion project, was born around the time Britons voted to leave the EU. Now it must fill 62 floors of London office space. The U.K.’s chief Brexit negotiator warned against backing May’s plan to reopen negotiations in a series of emails to senior officials, according to the Daily Telegraph. The EU can’t rescue the U.K. from its “Brexit chaos” because May’s government is no longer a trusted partner, Philip Stephens argues in the Financial Times. Trade Warning | May’s efforts to renegotiate the terms of Britain’s exit have drawn warnings from Washington that the push could jeopardize British trade talks with the U.S. In an interview with Bloomberg News, Representative Brendan Boyle, a Pennsylvania Democrat and member of the Friends of Ireland Caucus, said he and others in Congress were concerned Brexit would see the return of a policed border between the Irish Republic and Northern Ireland. Car Woes | The British automotive industry saw investment plunge last year as carmakers delayed decisions on upgrading machinery and factories amid mounting concern about the impact of a no-deal Brexit. Spending plunged 46 percent to 589 million pounds ($769 million), the lowest since the global financial crisis, the Society of Motor Manufacturers said on Thursday. 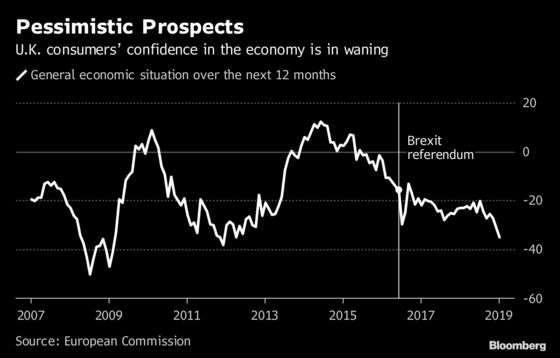 Looking Gloomy | U.K. consumers are the least optimistic about the economic outlook in seven years as a lack of clarity over the nation’s exit from the EU leaves them worried about Britain’s prospects. A GfK gauge of expectations for the U.K.’s general economic situation for the next 12 months has tumbled in the past year, and is approaching levels last seen in the depths of the financial crisis, the market-research firm said in a report on Thursday. A headline measure of confidence stayed at the lowest since 2013, GfK said. 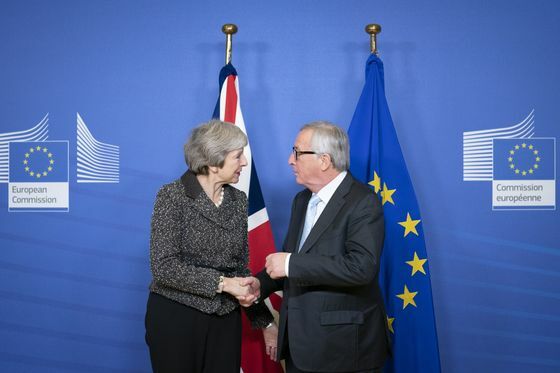 Funding Gap | The U.K. will be left with a multi-billion-pound gap in funding for housing, transport and infrastructure when Brexit cuts off access to the European Investment Bank, according to a parliamentary report. EIB funding for British projects has shrunk 87 percent since the referendum in 2016 and the country will lose access entirely under the current terms of departure from the EU scheduled for March 29, the report said. The EIB is the EU’s lending arm, funded by its member states. The U.K. also stands to lose 7.6 billion euros ($8.7 billion) on its previous contributions to the EIB. Brexit Upside | For one Canadian tech company, Brexit could mean more business in the U.K. CGI Group Inc., an information-technology provider that employs 5,000 people in the country, is bracing for increasing demand for its services as government and companies alike adjust to new rules and the economic unknown. While it has offices throughout continental Europe, CGI plans to keep its U.K staff put. Money Talks | Theresa May is preparing to entice Labour MPs to support her Brexit deal with a cash injection into deprived areas that supported Leave, including former mining communities, the Times reports. One of the people involved in the negotiations said that Downing Street was pressing for details of potential investments.